“Visualizing the entire 2010 Atlantic hurricane season in one image“. Anthony Watts copy and pastes a NOAA visualization of all of 2010’s North Atlantic hurricanes to feed his reader’s need to complain about them durn scientists. And Al Gore. The hurricane visualization Al Gore should have used? “AGW Defender Flowchart“. 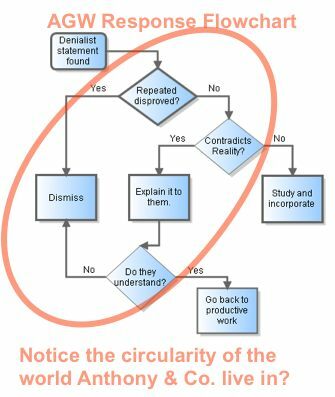 Anthony Watts copies-and-pastes a “funny flowchart” that dismisses criticism of climate denial as a mindless formula. Oh, the irony. Of course if Anthony and his partners ever dug up a new idea there wouldn’t always be the same scientific or political criticism to answer it. O…M…G – Video explodes skeptical kids in bloodbath. Anthony Watts joins in the “astonishment” and “outrage” over this poorly conceived video. I have to point out that the blowin’ up kids bit is only the first of the four scenes. No compassion for white-collar workers, footballers or hard-working narrators? 10:10 exploding skeptical children video “disappears”. Anthony wants to know where the video has gone. Did Dr. Phil Jones e-mail everyone to delete it? Wait he’s found it again! Those wishing to refresh their outrage should click-through. A message to 10:10 -”sorry”, just doesn’t cut it. Why, oh why would Anthony accept the video author’s apologies when he can continue to use it to malign all environmentalists? WUWT’s story on 10:10 – 3rd most popular on WordPress globally – even in New Zealand. Anthony boasts about his web statistics. That was a given, wasn’t it? Blow Me Up, Blow Me Down. Thomas Fuller continues to represent this video as proof that environmentalists think that “it’s okay to ostracize, bully and dismiss those who don’t agree that climate change”. Apparently their intent “is to legitimize the cruelty of children towards each other”. Go get ’em, Junior! Thomas knows he’s gone off the deep end though, because he spends a lot of time trying to preëmpt charges of Nazi allusions (while accusing environmentalists of doing it first). “Global Work Party Day on 10/10/2010: come up with your own event“. Anthony Watts can’t out-argue climate scientists, so he tries to find easier pickings criticizing actor Ellen Page’s video in support of 350.org’s “Global Work Party Day”. And he still loses! For science that’s accessible but credible, steer clear of polarizing hatefests like atheist or eco-apocalypse blogs. Instead, check out scientificamerican.com, discovermagazine.com and Anthony Watts’s blog, Watts Up With That? One regret: the Watts blog. Virtually everyone who emailed me pointed out that it’s as axe-grinding as anything out there. I linked to it because has a lively voice; it’s detail-oriented and seemingly not snide; and, above all, it has some beautiful images I’d never seen before. I’m a stranger to the debates on science blogs, so I frankly didn’t recognize the weatherspeak on the blog as “denialist”; I didn’t even know about denialism. I’m don’t endorse the views on the Watts blog, and I’m extremely sorry the recommendation seemed ideological. Anthony of course considers this proof that Heffernan succumbed to intellectual bullying from those nasty, hateful, lying scientists. Or is he just disappointed that a gullible newcomer with the correct political perspective has slipped through his fingers? Tim Lambert over at Deltoid has a good overview: Post-modernism rides again at the New York Times. Monckton’s response to John Abraham is magnificently bonkers by George Monbiot at the Guardian. I think that they might have to rename it the Monckton gallop and Why is Monckton afraid of a debate with Abraham? at Deltoid. This is where Eli came in and Gold amongst the dross at Rabett Run. The University of St. Thomas’ final response to Monckton, after a short e-mail exchange? We received your email response to our June 25, 2010 letter. The University of St Thomas respects your right to disagree with Professor Abraham, just as the University respects Professor Abraham’s right to disagree with you. What we object to are your personal attacks against Father Dease, and Professor Abraham, your inflammatory language, and your decision to disparage Professor Abraham, Father Dease and The University of St Thomas. Please be advised that neither we nor the University of St Thomas will communicate with you any further about your decision to sully the University of St. Thomas, Professor Abraham, and others rather than to focus on the scholarly differences between you and Professor Abraham. Denialists are actually casting this as proof that Monckton’s “rebuttal” has won the day! “Most idiotic global warming headline ever“. Anthony Watts should look in a mirror I think. He’s found a “what-if” newspaper article in a new-to-me paper called The Canadian about methane hydrates from 2007 to get steamed over. He recommends not reading. Instead, send an angry letter to the editors.